Cordoba is 244 miles south of Madrid. It is the capital city of the province of Cordoba, in the region of Andalusia. 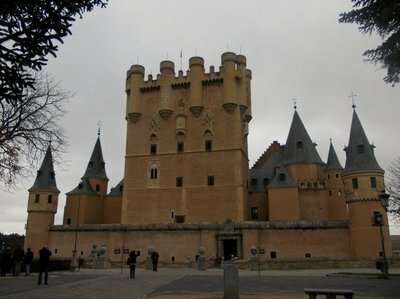 We arrived on the AVE, high speed train from Madrid, at 917 pm on 30 November. Travel time was just under two hours. 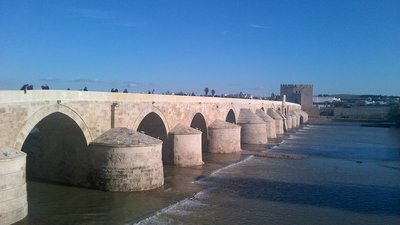 Cordoba was founded by the Romans in 164 BC. Seneca, the Roman philosopher, was born here. The Moors, medieval muslims from North Africa, arrived in 711. Moorish Cordoba became the wealthiest, most opulent city IN THE KNOWN WORLD and was made capital of al-Andalus. The territory of al-Andalus took in most of Spain, Portugal, Gibraltor and part of France. In 1236 the Christian army from Castile took Cordoba. 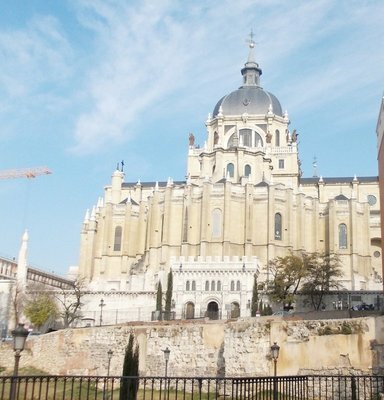 The Mosque, the most emblematic monument of the Spanish/Moorish culture, became a Christian church. Later a Cathedral was erected in the centre. It may be the third largest mosque in the world. On one side of the Mezquita-Catedral is the Guadalquiver, Andalusia's largest river, and on the other side is our budget hotel. Great location. We walked across the Roman Bridge, built in the first century. The streets are narrow and twisting in the old town. Numerous small souvenir shops selling tiles and flemenco style aprons. Lots of engraved leather, tooled leather, a craft passed down from the Moors. We are adjusting from the four star hotel in Sagovia to this one??? star hotel and from our three course meals in a dining room with linen to tapas bar fare. Do not order pizza, it is nothing like pizza as we know it, not a drop of tomato sauce, the one we had as a quick meal option at midnight was awful. We are staying two nights at Los Patios right across the street from the mosque, the location is excellent, rate for room with twin beds and private bath including tax is 33 Euros per night, no breakfast. 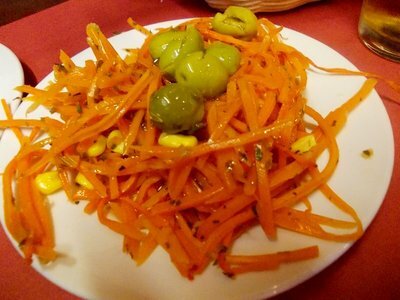 Do order tortilla (egg and potato omelette), or paella, rice with saffron, vegetables and either meat or seafood. You cannot go wrong with these two dishes. There are a lot of orange trees in the courtyard of the mesquita. On Dec 2 we move hotels in Cordoba. Los Patios is very well located and less than forty five dollars a night, but our room was just over an enclosed courtyard where food is served so two things, noisy and the window did not face the outside, it faced the overview of the courtyard. Not good for me, I like quiet and the opportunity to see blue sky and the streetscape. So this turns out to be a one star, very good reviews by the way, and we are moving to Cordoba Centro, a three star, for only a few dollars more. 35 Euros per night. 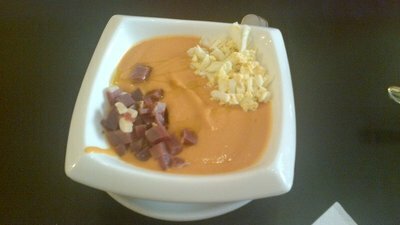 Salmorejo is the signature dish of Cordoba. It is a cold soup, some similarities to gazpacho, they both have pureed tomatoes, did I say that? However, it is made differently, has a garnish of ham and chopped hard boiled egg and it is good. We had hot chocolate with cake doughnuts while waiting to check in. This is Sunday. Our room is nicer, has a big window, therefore, lots of chilly air comes in through the glass. Nice heavy draperies though so ok, if I peak through the drapes, the sun is shining and the sky is blue. I had bull's tail and veggies for supper. It looked like a whole pot roast on my plate, lots of potatoes, but actually was not all meat, of course. The meat was tender and flavourful, I do not know if the bull was killed in the ring. Ole. We toured the mosque (Mezquita) on 3 Dec, it is huge, converted to a Christian church, has a massive pipe organ which was played for a time while we were there. The mosque interior is free to the public between 830 and 930 am. You must arrive well before 930 though or you will not be given access. Very impressive by the way, it has 856 pillars. We are heading out for Seville today ( Monday), by train. Cordoba has a population of 325,000. We caught the 1255 pm high speed train from Cordoba to Saville on Monday 3 Dec 2012. The AVE can reach speeds of 280 km per hour. We arrived in Seville at 140 and were soon checked in to our 'boutique hotel", very clean twin room with private bath, friendly staff, no breakfast but well located and it costs 32 Euros a night, Callejon del Aqua..
A short walk, lunch at a tapas bar, stroll around the neighbourhood and then at 645 pm set out for the only flamenco museum in the world which happens to back onto our hotel. We wanted to see a flamenco show, and with a twenty percent off coupon which I stumbled upon in the 'The Tourist' magazine, we got tickets for 16 euros apiece. The set up was intimate, three rows back from the stage, a singer, a guitar player, a female and a male dancer. When i was about five my grandfather gave me a little plastic doll, maybe six inches high. She came in a clear cellulose tube with her name printed right on the container. Carmelitta. She had long black hair, done up in a twist, and a bright red satin dress with ruffles in the long skirt and she was soon removed from her home in the tube. She was constantly waving as one rigid arm was permanently held over her head. Her other arm was behind her back and she carried a little fan. She was a sultry observer to my games of hopskotch and jacks. When I attempted to give her a new hairdo, her fine raven coils let go from her head and now Carmelitta was bald. My mother tried to glue her hair back on, but she was never the same. In the first dance the female wore a black long sleeve pullover and black ruffled skirt. I was engaged by the hand movements, the clapping, finger snapping and the intricate footwork as well as the interaction with the male dancer who looked like Gene Wilder crossed with Nickolas Cage in tight pants and a bolero. In the second number the female dancer wore a long red dress, ruffles, a train. Carmelitta had come to life with rooted hair. There was passion, turmoil, salvation, determination. She was fierce, defiant, beaten, triumphant, omg she was every woman, the tears were streaming down my cheeks. I do not know if I got it....sort of shades of The Tin Soldier and the one legged ballerina, forgive me Hans Christian Anderson!! but if flamenco is music, dance, rhythm and that something else that has no name, then for me this was a moment. As my tears dried and pulled on the skin of my cheeks, I pondered this. 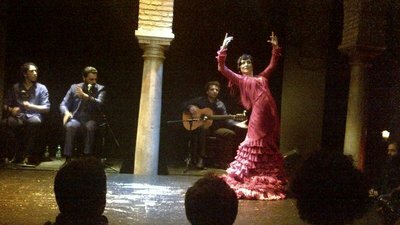 Seville is the beating heart of flamenco which was created by gypsies after they arrived in Andalucia in the fifteenth century. It is believed they came from a region in northern India called Sid, now in Pakistan. Guitar music and the tapping of feet were added later, and many cultures including Castillian and Arabic contributed. Fusion music and dance. A fine sunny day, good weather for the free walking tour that started from the square near the giroldo/cathedral at 11 am. Our boutique hotel is well situated, walking distance to everything we plan to see, no central heat, very drafty. So I slept in two jackets and with my hood up, not cool. I was frozen. Note to hotel owners:. If you provide a hair dryer and a lousy space heater the hair dryer may be used as a heat source. In the morning as I bent my stiff fingers around my toothbrush I had a eurica moment and used the hair dryer to thaw out my hands. Then I shot hot air up the sleeves of my jackets, warmed up a scarf, and wearing four long sleeve tops, a fleece and a jacket set out. It was warmer outside. First we booked our bus tour to Morrocco, leaves from Tarifa, three nights in a four star hotel in Marakesh, stops in Rabat, fine. Company name is Calin, we found it online and totally coincidentally their office is a block from our hotel. La Giralda was converted to a steeple from the original minaret. When the Christians added the Giradillo, a weathervane shaped like a woman, atop a Rennaissance style belfry, the giralda reached almost one hundred metres. There are 35 ramps to climb to the top. When the Moors used the minaret the muezzin, the guy who did the call to prayer five times a day, road a horse or donkey to the top. 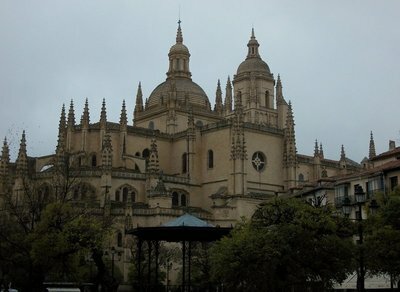 When the Christians took over the only part of the mosque they retained was the towering minaret and then they built the largest gothic cathedral in Europe around it. Near the converted mosque is the alcazar, fortified palaces with orange groves in the courtyard. Clever little canals in the brick pavement provide irrigation. Queen Isabel was married to Fernando, her cousin, a marriage based on convenience. Fernando was impotent and Isabel lusty. It is speculated she had an affair with Christopher Columbus. She had a sewing house in Seville where she sewed one month a year. In seven years she managed to sew one dress. Christopher Columbus is buried in the Cathedral. He died thinking he had discovered the passage to India via the West Indies. He may have brought an std back to Spain, it is said Fernando had syphyllis and that stds came to Europe from America. All of the potatoes, gold, cocao brought back from America came through Saville, a tax was levied from the gold tower. Tiles on the roof of the gold tower sparkle in the sun. 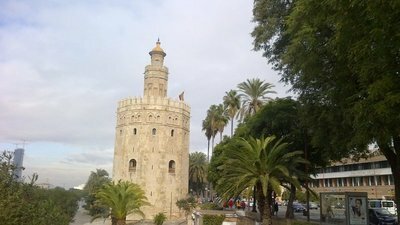 Torre del Oro was built as a defensive tower in the thirteenth century, its arabic name, Bury Al Daheb means golden tower. Now it is Saville's Naval Museum. When the Christians defeated the Moors all residents were expected to convert to Christianity. The Spanish Inquisition looked after this. The Plaza Espana was built in 1929 in a kind of semi circle facing west like an embrace to the Americas. It was not the huge tourist draw anticipated due to the financial collapse on Wall Street. Today it is the most appealing square in Seville, five degrees warmer than the rest of the city. The temperature is about forteen degrees C today, but the humidity is high. It must be an oven in July. A lovely city park, Parqe MariaLuisa, is adjacent to the Plaza Espanya, still green in early December. The University of Seville used to be a tobacco factory and it was the setting for Carmen. (Carmen was a beautiful gypsy, worked at the tobacco factory, she seduced a French soldier who was guarding the factory so she could smuggle out tobacco and sell it on the black market, Napolean was running the show at the time, had an affair with a bull fighter, the soldier wasn't happy, etc). 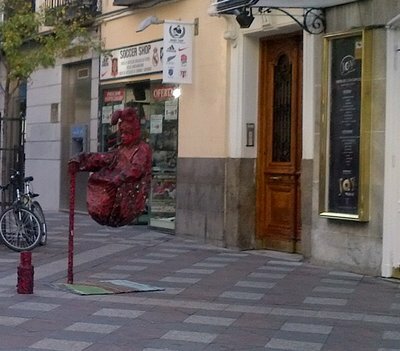 Across the river from the Golden Tower is the district of Triana, the birthplace of flamenco. In the old days there was no bridge connecting Seville with Triana, Seville was rich, poorer people like the gypsies lived in Triana. Note if you want to take flamenco lessons go to Japan. They have over 2000 schools of flamenco. Spanish includes over 10000 words derived from arabic. The Moors ran the show for 700 years and their influence is apparent in the architecture, the cuisine and the language. Any word starting with al is arabic origin, alcazar, for example. 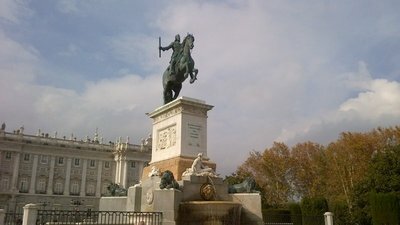 Right across from the town hall is a park with a statue of the Duchess of Alba. She is currently famous for marrying a man thirty years younger, if you see her picture you will decide to grow old gracefully, google her. She is extremely rich and has a lot of special privileges. For example she can enter the cathedral in a horse and buggy, has more titles than the queen of England, quite an intriguing old girl. She is something like 85 years old, her new husband is in his early fifties. Love match. There was a demonstration at the Town Hall, seemed pretty peaceful, clapping and singing, several police on the scene. If they were civil servants wanting more money they do not have much public support with unemployment over 25 percent. 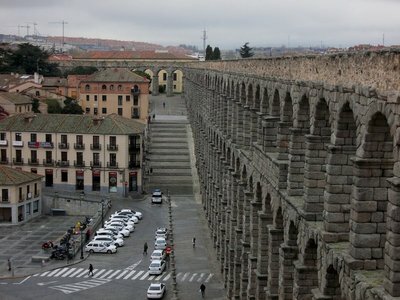 It cost seventy euro each from Madrid to Cordoba, 19.50 e each from Cordoba to Seville this was a deal, reg price on AVE is 35 and 18.50 from Seville to Tarifa by bus. 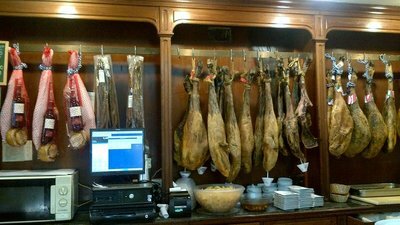 We eat several times in a tapas bar a few blocks from our hotel. 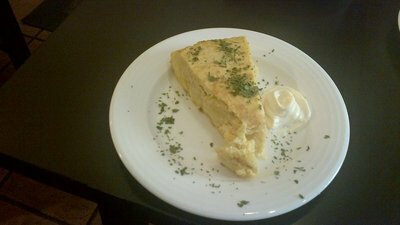 I like the tortilla, served cold in a pie shaped wedge with a dollop of mayo maybe its aioli on the side and Russian Salad, potato salad with tuna. This bar closes for some hours in the evening, reopening at eight pm. Good for a late lunch or late supper. Tapas are like appetizers, we make a meal of them. 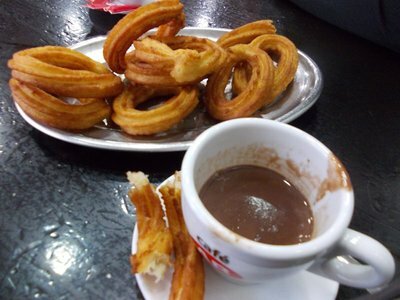 In Granada the tapas are free with your drink, not so common in Seville. But at two euro each you can have a nice supper for eight euro. Shopping - hair combs, fans, Lladros, tiles, shoes and leather. Seville has a population of about 700,000.